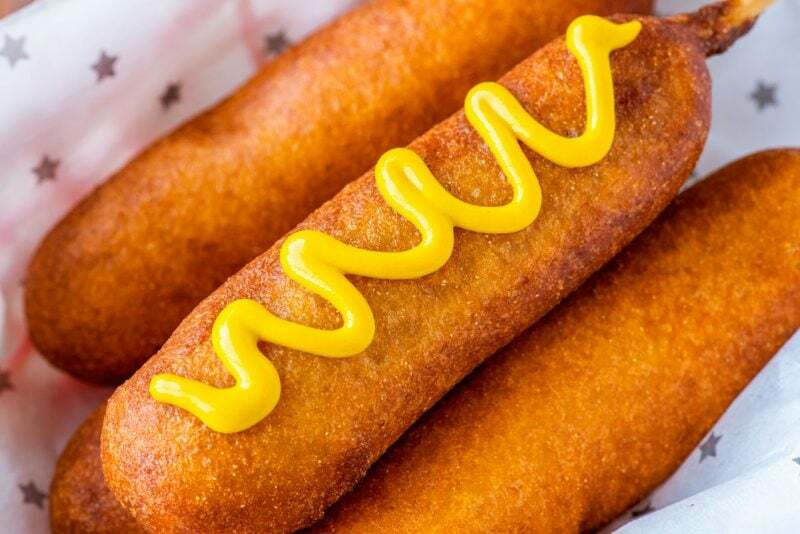 With a light, puffy breading (and a touch of sweetness) that's fried to golden brown perfection, you'll be surprised how easy it is to make homemade corn dogs! To hit every booth, stall, and food cart I could find. Which, of course, they totally were the best corn dogs I had ever had. Nothing beats that golden brown breading fresh out of the fryer. So, naturally, once I had returned from the happiest place on earth, I knew I had to find a way to recreate a similar experience at home. What are Disneyland corn dogs? Made famous by the Little Red Wagon food cart on Main Street USA in Disneyland, this carnival classic is a must-try for newcomers and a can’t-miss for regulars. The hand dipped breading has a slightly sweet taste and is typically served with mustard, apple slices, and a bag of chips. A wide skillet that’s at least four inches deep. Sturdy wooden sticks. I used these: Sturdy Bamboo Sticks. 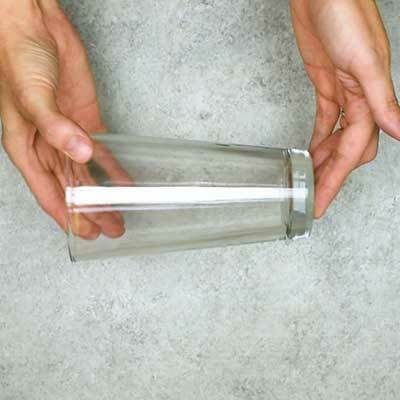 A tall drinking glass. 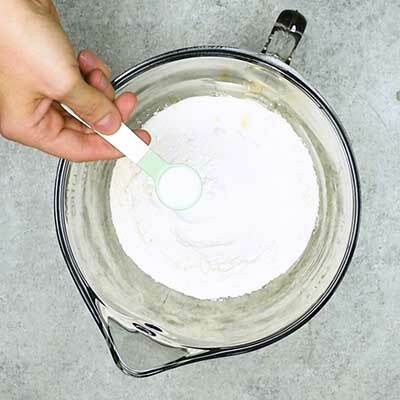 This will make coating the hot dogs in the batter a whole lot easier. 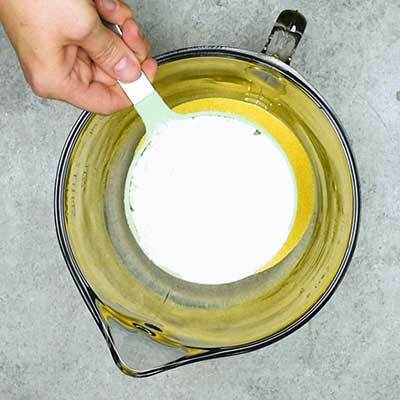 Two quarts of vegetable oil (or another oil of your choice) and a method to properly dispose of it (or reuse it) once you’re done. Can you freeze homemade corn dogs? Once the corn dogs are fried, let them cool to room temperature, then transfer them to a freezer container or bag. 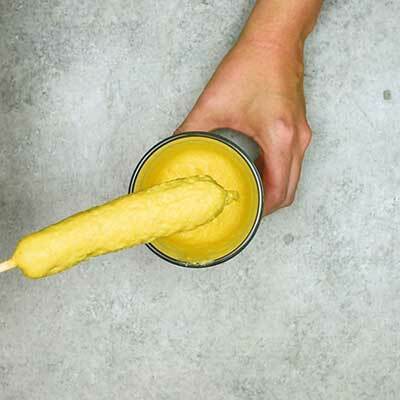 For best quality, corn dogs can be frozen for one to two months. When ready to eat, preheat oven to 350 degrees F and arrange corn dogs on a baking sheet. If corn dogs are still frozen, bake for 15-18 minutes. If corn dogs have been thawed, bake for 10 minutes. How long will corn dogs last in the refrigerator? 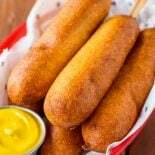 Once made, corn dogs can be kept in a sealed container in the refrigerator for up to four to six days. How do you make corn dogs? 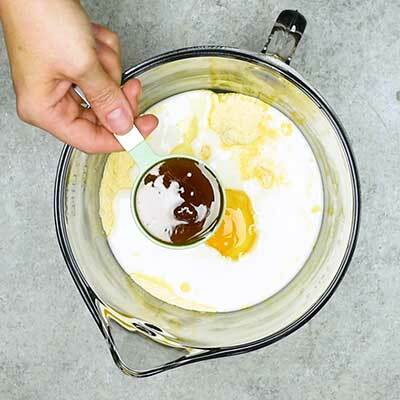 Step 1 – Make a creamy batter by mixing cornmeal, flour, baking powder, salt, buttermilk, an egg, honey, and vegetable oil. 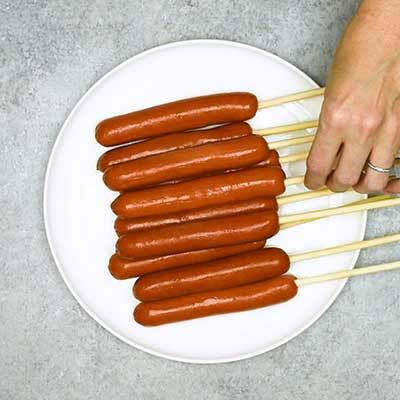 Step 2 – Thread hot dogs on sturdy wooden sticks, leaving enough room for a handle at the bottom. 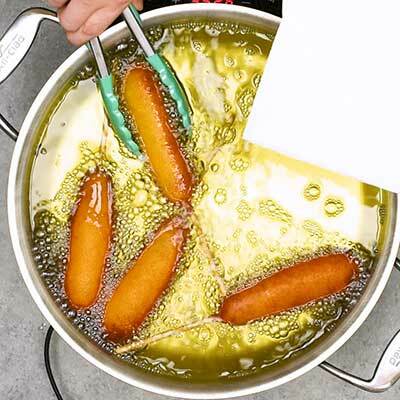 Step 3 – Dip the corn dogs in the batter, coating them all the way to the stick. 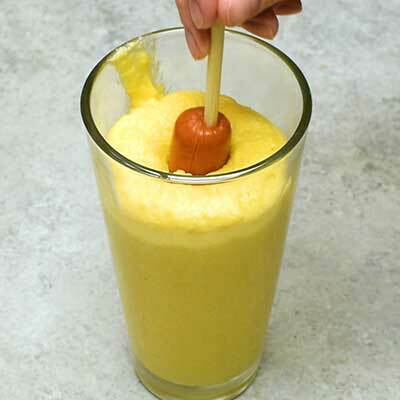 I’ve found it’s easier (and way less messy) to pour the batter in a drinking glass and then dip the hot dog inside. 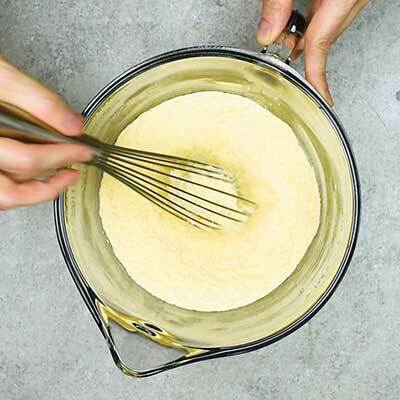 This way you get a nice even coating of batter without getting any on your fingers. 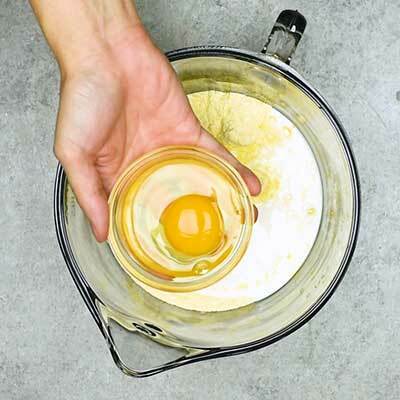 Step 4 – Drop the hot dog into a large, wide skillet full of hot oil. Let the hot dogs cook until golden brown and puffy. Once ready, use some tongs to transfer the corn dogs to a paper towel-lined plate to drain and cool slightly. 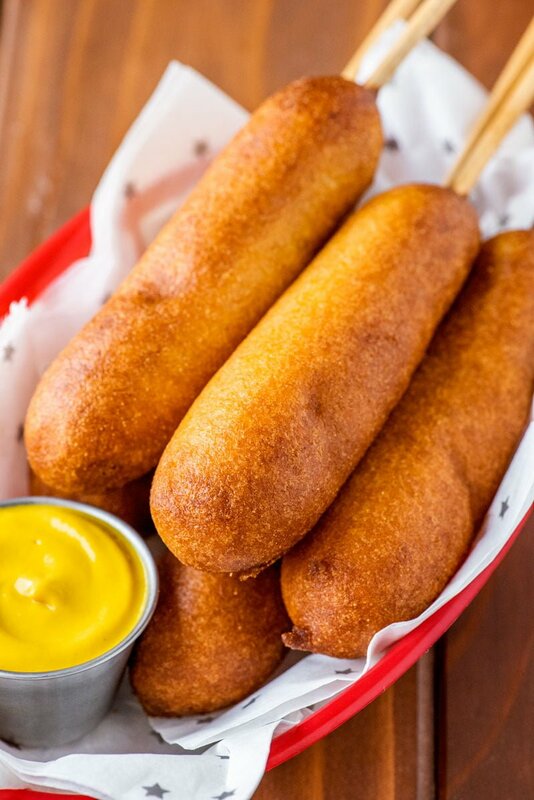 Made famous by the Little Red Wagon food truck, these hand dipped Disneyland corn dogs are iconic for a reason. With a light, puffy breading flavored with a hint of sweetness and fried to a perfect golden brown, you'll be surprised how easy they are to make at home! 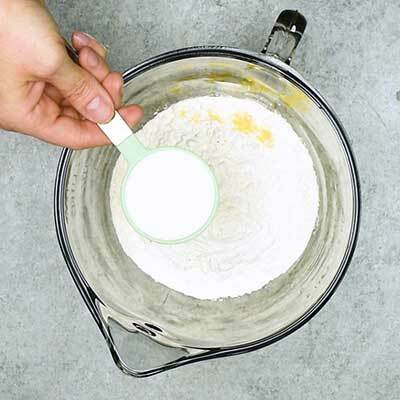 Add buttermilk, egg, honey, and 2 tablespoons of vegetable oil to bowl and whisk until thoroughly combined with the dry ingredients. 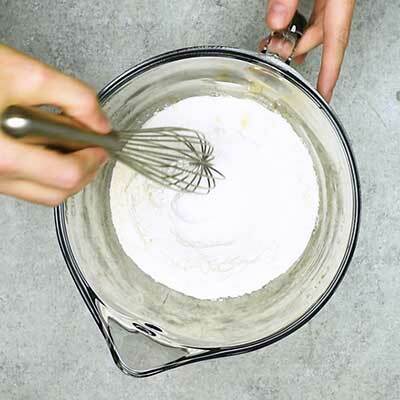 Set bowl aside and let batter rest 10 minutes. Thread hot dogs on to wooden popsicle sticks, leaving enough room to hold the bottom of the sticks while also securely keeping the hot dog in place. If needed, use a paper towel to pat the hot dogs dry. 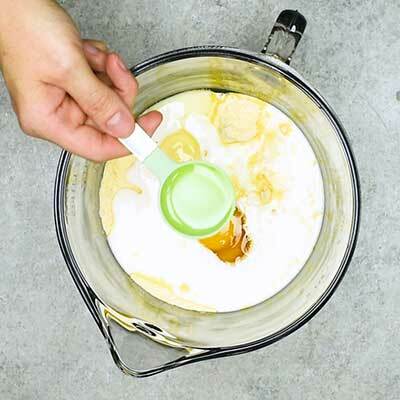 Give the corn dog batter a stir. 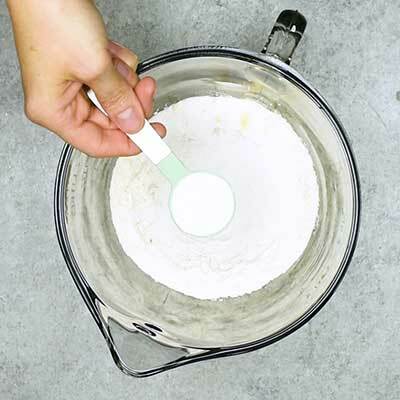 The batter should be able to thickly coat a spoon while also be fluid enough to slowly drip off. 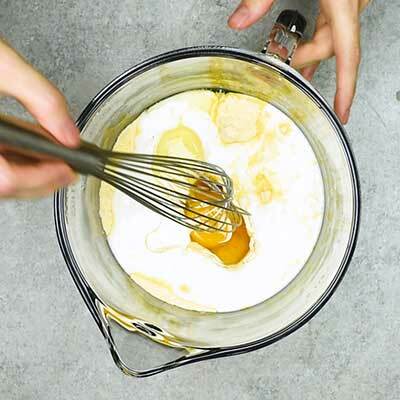 If batter is too thick, add 1 tablespoon of buttermilk and stir, then do another drip test. 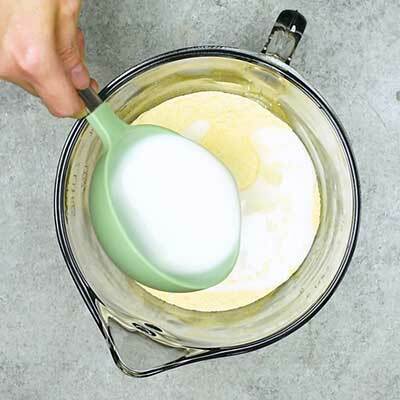 You can add up to 3 tablespoons of buttermilk to help even out the consistency. 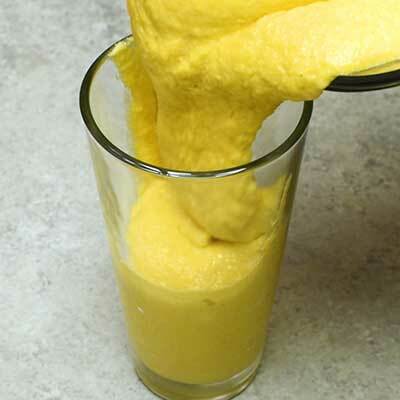 Pour corn dog batter into a tall drinking glass, filling to about 3/4 full. 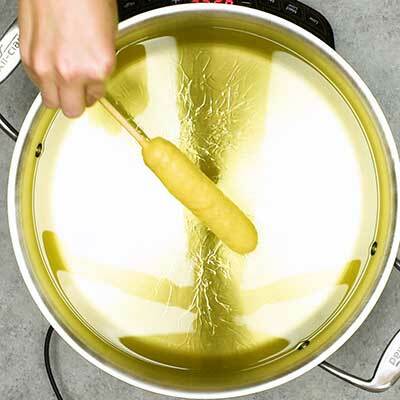 Dip a threaded hot dog into the batter, gently twisting to coat the hot dog up to the stick. 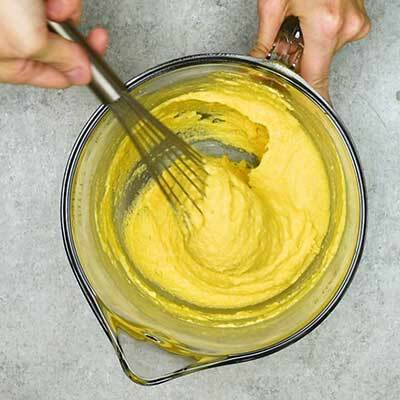 Slowly pull hot dog out of the batter, shaking off any excess. 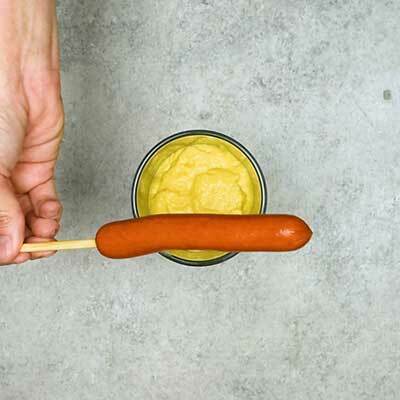 Holding the coated hot dog by the stick, gently drop it into the oil, letting go before the oil touches your fingers. Cook corn dog for 3-5 minutes, using tongs to turn the corn dog as needed. 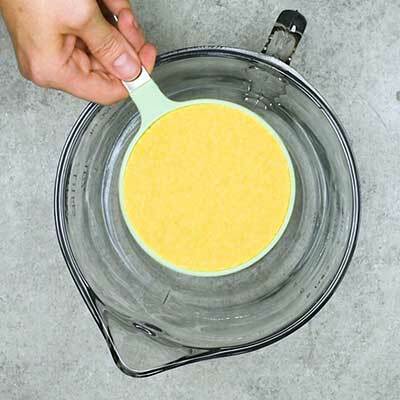 Use tongs to transfer corn dogs to a paper towel-lined plate. Repeat this step until all corn dogs are cooked. 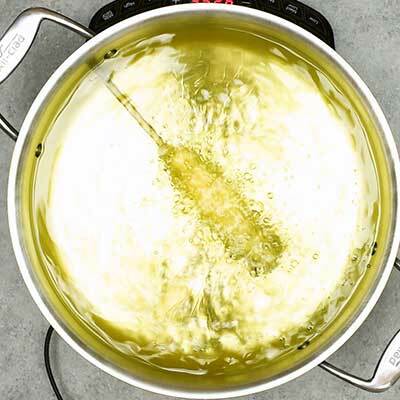 To speed things along, fry corn dogs in batches. 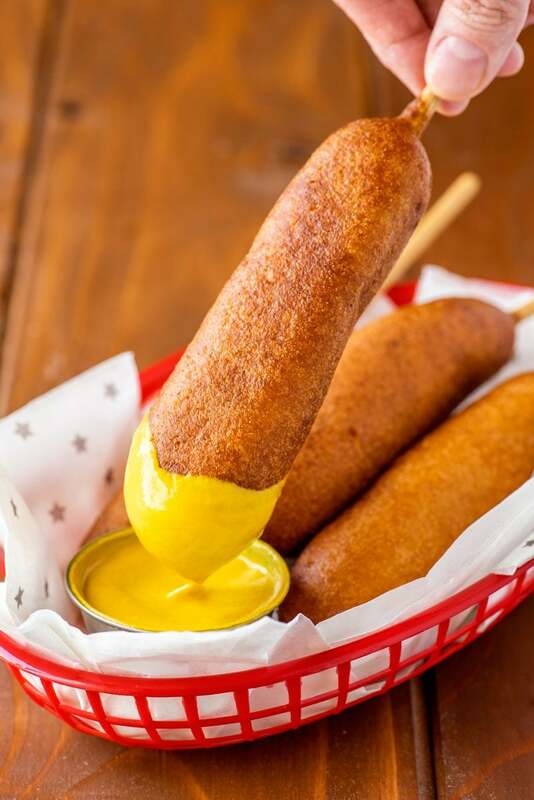 Serve corn dogs immediately with condiments of your choice.